Meal Planning and Quick Dinners – Elly Says Opa! I’ve been meal planning for quite some time. I do it for many reasons, including saving money on groceries, saving my sanity by not having to make repeat trips to the grocery store, and lessening food waste. Over the years, I’ve gone from pen and paper meal planning and ripping recipes out of magazines to “getting with the times” so to speak, and I thought I’d share with you some of my thoughts and strategies on the process. Plus, as the working mom of a toddler (who gets home 30 minutes before dinner is eaten), I’ve learned a few new tips myself for getting dinner on the table quickly. This is a long post, but I hope you find it useful. It’s broken into two sections: meal planning, and tips for quick dinners. Update: I have recently added our weekly menu plan to the sidebar. Check it out! I update it every Sunday. My first tip when it comes to making sure you stick to cooking meals at home as frequently as you planned is to have a fully stocked pantry. This ensures that you aren’t spending a ton of money buying ingredients for every meal each week, but it also means that if something doesn’t sound good on a particular night, or you forgot to thaw something or whatever, you can likely whip up something with what you have on hand. Plus, while I encourage coming up with side dishes to each main course you plan, that doesn’t always happen. In those events, it’s good to have things that can turn into quick and easy side dishes. Below is an outline of my meal planning process. Step 1: What do I already have on hand that needs to get used up? Do you have some buttermilk or sour cream leftover from last week? A head of romaine that’s not looking so great? Half a brick of cheddar or half a can of beans to use up? Add a meal that has those ingredients to your menu. Less stuff to buy, less food to waste. Tip: Keep a list of items in your freezer. You can keep this online, or simply just post a list on your freezer door, and add or scratch off items as they change. That way, you know what you already have available for meals, but also make sure you don’t forget about the 10 individual containers of pesto you have in the depths of your freezer (guilty). Step 2: What do I want to make? Okay, so you’ve made sure to include a recipe or two that will use your perishable ingredients. Not what? Well, what sounds good to you? I get ideas from other blogs, magazines, cookbooks, Pinterest, or just an idea in my head. 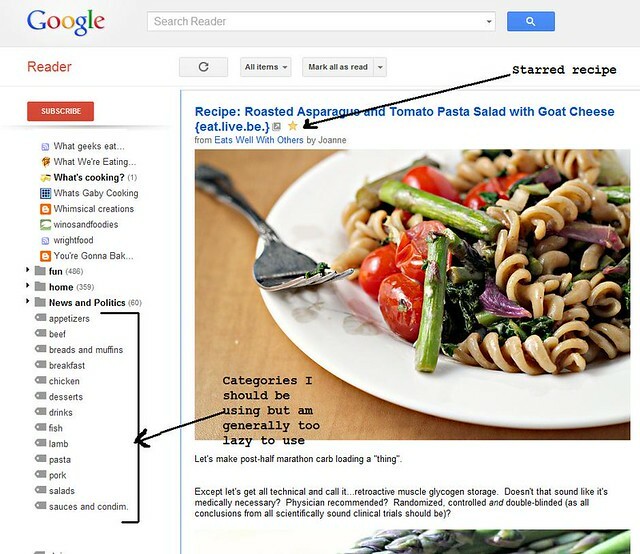 But, the place I save the large majority of recipes I want to try is Google Reader. In addition to following several food blogs in my Reader, I also get daily updates from various food publications like Cooking Light and Epicurious, which makes keeping most saved recipes in one place very easy. Any time a recipe sounds good to me, it gets the star treatment. Boom. Update: With Google sunsetting Reader (still a bit bitter about that…) there are other options, such as Feedly for saving recipes. Of course you can always go the Pinterest route. I’m currently using Pocket, which I enjoy so far and if you saved your Google Takeout file, you can import all your starred items into it, too. Any recipes I come across that may not be in my reader might get added to Pinterest, or simply to my Internet bookmarks folder, inside a subfolder with categories similar to those in my reader. If I come across a recipe in a publication, I try to find it online and save it that way rather than keeping paper around. I have cookbooks, but not as many as most bloggers. Unless I am craving something in particular, I tend to only flip through these every couple months, vs. every week and note any recipes I want to try in the coming weeks. I try to keep our week relatively balanced in terms of the protein – generally 1-2 vegetarian meals, 1-2 chicken, 1 beef, 1 shrimp, etc. You can also balance in terms of cuisine (though we all know I could easily eat 7 days of Greek and Mexican food). Do I care about sales? As far as sales go, a lot of grocery stores now keep their circulars online. You may want to browse that first, and make your meals based on items that are on sale. This is a good way to save a little money, or ensure you stock up on things that are on sale that you might otherwise miss because you’re only buying things on your grocery list. I’m not a big couponer, because I find that they usually don’t apply to the types of things we eat, but I keep Organic Deals and Saving Naturally in my reader, and often find printable coupons through those sites. I try to buy produce when it’s in season whenever I can (that doesn’t mean I always do; I make a conscious effort, but sometimes I need to eat tomatoes in December). It tastes better, and it’s usually cheaper. You can also check Local Harvest for farmers markets in your area. Step 3: Make a complete list of your meals. If you want to cook 5 days next week, you obviously need to think of 5 meals (or 3 meals and 2 leftovers, or any combination you prefer). Typically, I add things to my menu haphazardly throughout the week, but Friday nights are when I really sit down and make a list of meals and groceries (I know, I’m a party animal). In addition to all your main dishes, you’ll want to think of sides (when necessary). 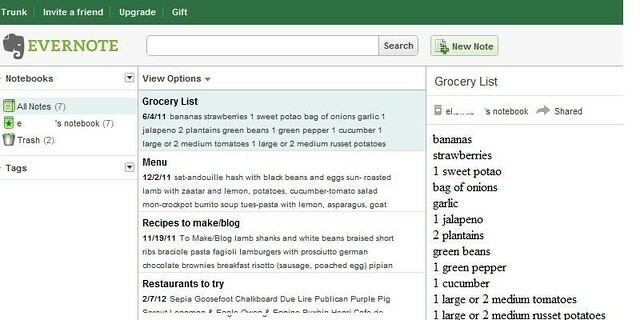 I like to use Evernote both for meal planning and for grocery lists (and for lists of restaurants I want to try, stuff I want, random recipes, the list goes on). There are many reasons for this. For starters, it’s online (duh) and I am online, almost always. So, if I think of a random dinner idea I want to make next week while I’m on the train, I can just throw it on the list so I don’t forget. Sometimes I already have a week planned out, but I might think something sounds good for the following week, in which case I just throw it on the bottom of this week’s list because, let’s face it, I won’t remember what it was when Friday comes around. Plus, any time I add a meal to my list, I can just toggle over and add the groceries for that meal to the other list. Whenever I’m making a recipe from a blog or website (whether it’s my own or someone else’s) I can also link to it, which saves me time from trying to find it later on. You don’t necessarily have to assign days to your meals, of course. As long as you plan accordingly (whether it means thawing meat or what have you), you can just make the list. I like to assign days, because I try to keep my heartier produce for later in the week, but I also will swap a couple days here and there. No biggie. I know a lot of people use Google Calendar, so that’s another option you can try, too! The other reason I really like Evernote is that—though this may surprise you—Tom (and Zachary) do the actual grocery shopping at our main store (I tend to do the meat shopping at the butcher shop). With Evernote, I can just email Tom the list directly (or share it to his Evernote), which eliminates paper and the potential for forgetting the list at home. Plus, there are staple foods (milk, eggs, garlic) that are basically always on the list and I can just modify last week’s list without having to re-add things. I also sort the list by aisle, because I’m cool like that. Tom gets whatever is on the list, and that’s it. No random or unplanned items. Usually. I used to have close to an hour between getting home and eating dinner, but since I now work a little further from home, I have less time. I get home at about 5:50. We used to eat dinner pretty promptly at 6:00 but now we eat closer to 6:15-6:30 most nights. It took me a few weeks of returning to work to get into my new groove. At first, I was pretty nervous about the whole thing, and having SUCH a hard time coming up with meal ideas, but now I’ve gotten into a good routine and it’s not nearly as difficult. My first few weeks of the new job went something like this, and this helped a lot because I was only cooking 2 out of the 5 weeknights. I sometimes still follow this schedule but generally I’m cooking from scratch about 4 nights during the week and the 5th day might be something from the freezer, crockpot, going out, etc. Sunday: While making Sunday’s dinner, also make Monday’s. Meals that prep really well include baked pasta dishes, enchiladas, casseroles, soups and stews. Make the meal in its entirety, or up to the baking stage. Monday: Bake/heat up whatever you made Sunday (Tom and Zachary get home about 15 minutes before me, so Tom will throw the dish in the oven, heat it on the stove, etc.). When I get home I might have to make a salad, and that’s it. For a while, I’d been considering adding a “quick and easy” category to my blog but the thought of poring over hundreds of posts to categorize things seemed daunting. Well, about 2 weeks into my new job, I went ahead and did that because the time spent doing that was more than saved by having an easy place to find meals I can make in the short amount of time I have during the week. So, definitely sift through that category. I hope it’s as helpful to you as it is to me. Some other meals that always come together quickly are burgers (and you don’t have to be boring with them, the possibilities are endless), chicken breasts and paillards (a max of 12 minutes to cook on the stovetop), stir fries, pasta dishes (there are plenty where the meal comes together while the pasta cooks), breakfast for dinner, and hearty salads. You can do as much or as little prep as you want and have the time for. Obviously if you are making a meal that’s easy to put together in 20-30 minutes, you may not need to do any. But, you can always do things like slice vegetables, peel and cut potatoes (store them in water in the fridge), pound or marinate meats, make sauces, etc. There are obviously countless things you can make ahead and what you want to make will obviously depend on what you like to eat. We eat a fair amount of brown rice in this house, and I simply don’t have time to cook it during the week any more. So, rather than relegate it to weekends only, I make big batches of it, and then freeze it in meal-sized portions. You can just microwave it whenever you want. A good rule of thumb is that you’ve seen something prepared and frozen in a store, you can do it yourself for a fraction of the price. Seriously, browse Trader Joe’s frozen foods and you will get plenty of ideas, I guarantee it. I don’t go out of my way to make freezer meals, and I know I don’t have them as often as other people do. That said, a lot of times there is no more effort put into making 2 of the same meal than one, and you can just freeze the second one. Or, simply freezing a half batch of something. This works particularly well with casserole type dishes, baked ziti, enchiladas, etc. Several slowcooker meals also make a lot, and I just freeze the leftovers. You can eat them the same way or repurpose them. Recently I froze some of this Tex-Mex chicken stew and we were able to eat it a few weeks later. I love to freeze this pulled chicken because it makes a ton. I froze leftovers of this Cuban pork and repurposed it into Cuban quesadillas. Sometimes you may need to cook a little something on “frozen meal” nights but it should never be as time consuming as making a whole meal. It’s great to have some pizza dough in the freezer, as well as some pesto or pasta/pizza sauce. Tortillas and pitas freeze great and are good for quesadillas or mock pizzas, too. I always keep shrimp in my freezer because even on a night where nothing is planned, cooking some shrimp in a pan and adding it to pasta is pretty much always a possibility. So, there you have it. A very lengthy version of my weekly routine. Do you have any tips for meal planning and quick dinners? Any other questions/things you’d like to hear about?